Glucocorticoids (GC) are potent anti-inflammatory and immunosuppressive agents that act on a variety of immune cells, including monocytes and macrophages. However, the exact cellular mechanisms underlying this anti-inflammatory capacity are still unknown. In our study, we determined the induction of apoptosis by GC in human monocytes. Peripheral blood monocytes were isolated by density centrifugation methods with a purity of >90% and were cultured in RPMI 1640 medium. Monocyte apoptosis was determined by four independent methods, including annexin-V staining, TUNEL, DNA-laddering, and typical morphology by means of transmission electron microscopy. TNF-α and IL-1β were measured by ELISA. GC receptor was blocked with mifepristone. Caspase 3 was inhibited with caspase-3 inhibitor (DEVD-CHO). Stimulation with different GC at therapeutic concentrations resulted in monocyte apoptosis in a time- and dose-dependent manner. Necrosis was excluded by propidium iodide staining. Proinflammatory cytokines such as IL-1β and TNF-α were down-regulated by GC treatment. 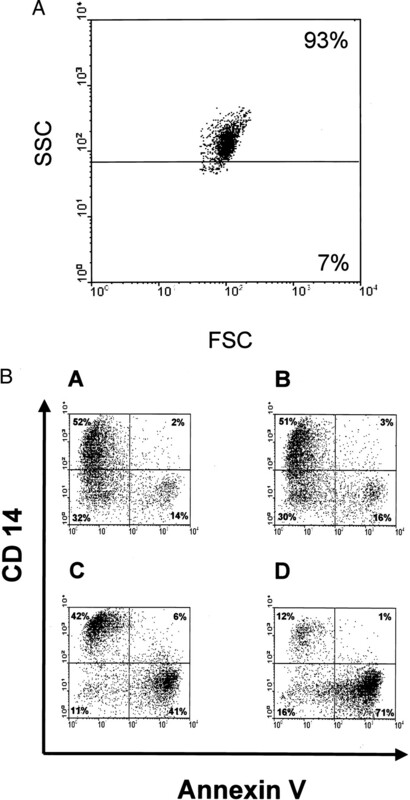 Continuous treatment of monocytes with IL-1β, but not with TNF-α, could almost completely prevent GC-induced cell death. The addition of mifepristone or caspase-3 inhibitor could partially abrogate GC-induced apoptosis as well as GC-induced inhibition of IL-1β. This is the first study to demonstrate induction of apoptosis by GC in human monocytes. GC-induced monocyte apoptosis may be partially mediated through effects on IL-1β production. It is conceivable that GC exert their anti-inflammatory capacity in various diseases, at least in part, by the induction of apoptosis in monocytes. Monocytes and macrophages belong to the main effector cells of the immune system, because they play a central role in the initiation, development, and outcome of the immune response (1, 2). They are known to secrete a variety of proinflammatory mediators such as TNF-α, IL-1β, IL-6, IL-8, proteases, or free oxygen radicals (3). In addition, they also produce anti-inflammatory cytokines such as IL-10 (4, 5), IL-1Ra (6, 7), or soluble TNF receptors (8, 9). Peripheral monocytes as well as differentiated tissue macrophages are known to play a key role in the inflammatory process of various immunomediated diseases such as inflammatory bowel disease (10, 11), rheumatoid arthritis (12), or sepsis (13). Glucocorticoids (GC)3 are potent anti-inflammatory and immunosuppressive agents that act on many cells including monocytes (14). They are potent down-regulators of monocyte-secreted proinflammatory mediators including TNF-α (15, 16), IL-1β (17), or IL-6 (18), which mediate inflammatory activity in various diseases (19, 20, 21). However, the exact cellular mechanisms by which GC exert their anti-inflammatory capacity in monocytes are only incompletely understood. Apoptosis is a physiological self-destruction mechanism that is regulated by an endogenous program and signals from other cells. It is characterized by typical morphological features and leads to the removal of the dying cell by macrophages in a way that prevents the onset of inflammatory reactions (22, 23). Monocytes have been shown to undergo rapid apoptosis in culture unless stimulated with LPS or with proinflammatory cytokines such as TNF-α or IL-1β, which enhance monocyte survival by omitting the initiation of apoptosis (24, 25). Recent studies dealing with the role of anti-inflammatory cytokines and their suppressive effects on monocytes demonstrated that IL-4 as well as IL-10 is able to induce apoptosis in monocytes (26, 27). Therefore, it was postulated that the regulatory role of anti-inflammatory cytokines in the development of inflammatory reactions also involves the regulation of monocyte apoptosis. In the present study, we investigated whether GC might evoke apoptosis in human monocytes. Using four different methods for the determination of apoptosis, we could clearly demonstrate that GC at therapeutic concentrations are strong inducers of apoptosis in human monocytes in a time- and dose-dependent manner. Our data suggest that, at least in part, the well-known anti-inflammatory and immunosuppressive effects of GC on monocytes and macrophages are mediated by the induction of apoptosis. PE-conjugated mouse anti-human Leu M3 mAb (anti-CD14, clone P9, IgG2b) and control mAb of appropriate Ig isotype were obtained from Becton Dickinson (Palo Alto, CA). FITC-labeled annexin-V (1/1 stoichiometric complex) was purchased from Bender Medsystems (Vienna, Austria). Caspase-3 inhibitor (28, 29, 30) was obtained from Calbiochem (65812 Bad Soden, Germany), and dexamethasone, prednisolone, hydrocortisone (water-soluble), mifepristone (31) (GC receptor antagonist), and all other reagents were obtained from Sigma (St. Louis, MO). Human monocytes were isolated from 40 ml of EDTA-treated blood, drawn from healthy volunteers, or from fresh leukocyte buffy coats. We used a modification of the recently described hypotonic density gradient centrifugation method with Ficoll and Percoll (32). Briefly, mononuclear cells were collected from the interphase after Ficoll separation and washed twice in PBS. Subsequently, cells were separated into lymphocytes and monocytes on a hypotonic Percoll density gradient (1.129 g/ml). From the two interphases, the upper interphase containing the monocytes was collected and washed three times with PBS. The monocyte suspension was adjusted to 106 monocytes/ml and plated on 24-well plates (Greiner, Solingen, Germany). Monocytes were further enriched by a 90-min adherence to culture plates and washed two times with PBS. Enriched monocytes were incubated in RPMI 1640 medium supplemented with 1% (v/v) heat-inactivated, pooled AB sera (complete culture medium) for 24–96 h in the presence or absence of dexamethasone (10−9 to 10−3 M), prednisolone (4 × 10−6 to 4 × 10−3 M), and hydrocortisone (3 × 10−5 to 3 × 10−2 M). All culture reagents used had endotoxin levels of <0.01 ng/ml LPS. The viability of the monocytes was >95% as determined by trypan blue exclusion; purity was >90% as assessed by flow cytometric analysis (Fig. 1⇓A) and nonspecific esterase staining. A, Monocytes were isolated by density centrifugation methods (Ficoll and Percoll) with a purity of >90% and cultured in RPMI 1640 medium for 48 h. Cell were analyzed by flow cytometry. B, Effects of dexamethasone on monocyte annexin-V binding and CD14 expression. By multiparameter flow cytometry, CD14 expression on monocytes was measured by staining with PE-labeled anti-CD14 mAb Leu M3. 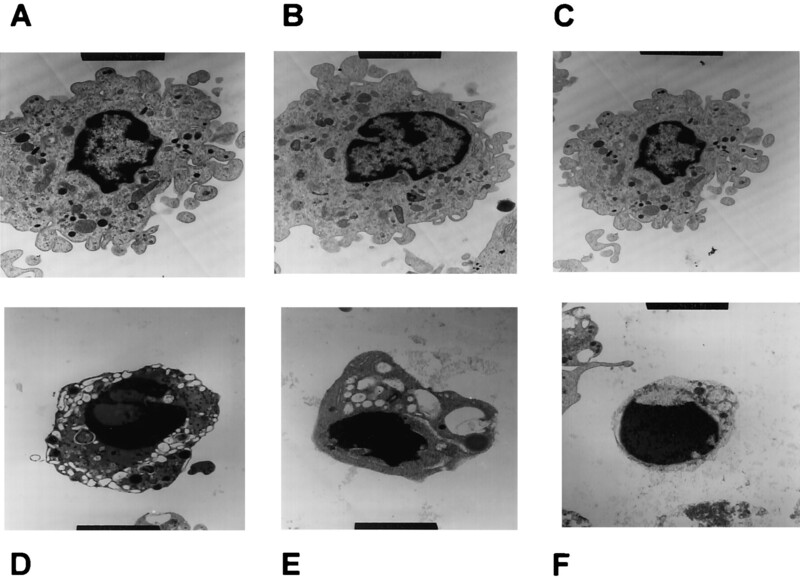 Apoptosis was determined by staining with FITC-labeled annexin-V. Monocytes were cultured in medium alone (A) for 48 h or were incubated with different concentrations of GC (B, 10−8 M dexamethasone; C, 10−6 M dexamethasone; D, 10−4 M dexamethasone). Compared with medium control, dexamethasone enhanced the annexin-V binding followed by down-regulated CD14 expression. Cell recovery was 94 ± 4% after 48 h and was not affected by the different types of stimulation. Monocytes, prepared and treated as described above, were double-labeled with PE-conjugated Leu M3 mAb (anti-CD14) and annexin-V FITC in PBS (with 100 mg/l CaCl2 and 100 mg/l MgCl2) for 1 h at room temperature in the dark. PE- and FITC-conjugated murine IgG mAbs of unrelated specificities were always used as controls. After staining, the cells were washed twice with PBS and measured by flow cytometry. DNA extraction and electrophoresis were performed as described previously (33). In brief, 1 × 107 monocytes were first lysed by a hypotonic lysing buffer (10 mM Tris-HCl, 1 mM EDTA, and 0.2% Triton X-100, pH 7.4). 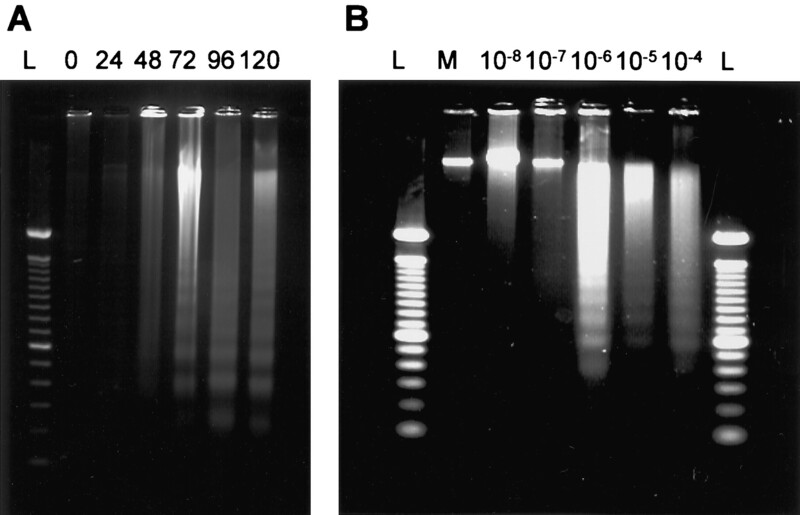 After centrifugation (14,000 × g, 30 min) supernatants containing cleaved chromatin were treated with RNase (50 mg/ml) and proteinase K (100 mg/ml); DNA was extracted by phenol/chloroform/isoamylalcohol. After precipitation with conc. ethanol (99.6%) at −20°C and drying and heating of samples, equal amounts of DNA were loaded on a 1.8% agarose gel and separated by electrophoresis for 2 h at 80 V. The lower detection limit for visualization of oligonucleosomal bands was 1.0 μg of DNA. DNA strand breaks were identified by labeling free 3′-OH termini with modified nucleotides in an enzymatic reaction. TdT catalyzes the polymerization of nucleotides to free 3′-OH DNA ends in a template-independent manner. First, monocytes were fixed in 4% paraformaldehyde at room temperature for 30 min. Subsequently, the cytoplasma membrane was permeabilized with 0.1% Triton X-100 for 2 min on ice. In the next step, DNA was labeled with FITC-conjugated NTP in the presence of TdT for 1 h at 37°C. After labeling, cells were washed twice with PBS and analyzed by flow cytometry and immunofluorescence microscopy. Cells labeled in absence of TdT were always used as negative controls, whereas cells pretreated with DNase after permeabilization were used as positive controls. Typical morphological alterations indicative of apoptosis were evaluated by TEM. Cells were washed off the culture plates, centrifuged, fixed in 1% glutaraldehyde/0.1 M sodium cacodylate-HCl (pH 7.4), and postfixed in 1% OsO4/0.15 M sodium cacodylate-HCl (pH 7.4). Samples were dehydrated in ascending ethanol series and embedded in epoxy resin (Epon 812). Ultrathin sections were mounted on 150 mesh Formvar-coated copper grids and poststained with aqueous saturated uranyl acetate and 2% lead citrate before being examined on a Philips CM 10 electron microscope (Philips Electronics, Mahway, NJ) at an accelerating voltage of 60 kV by one of the authors (M.S.). 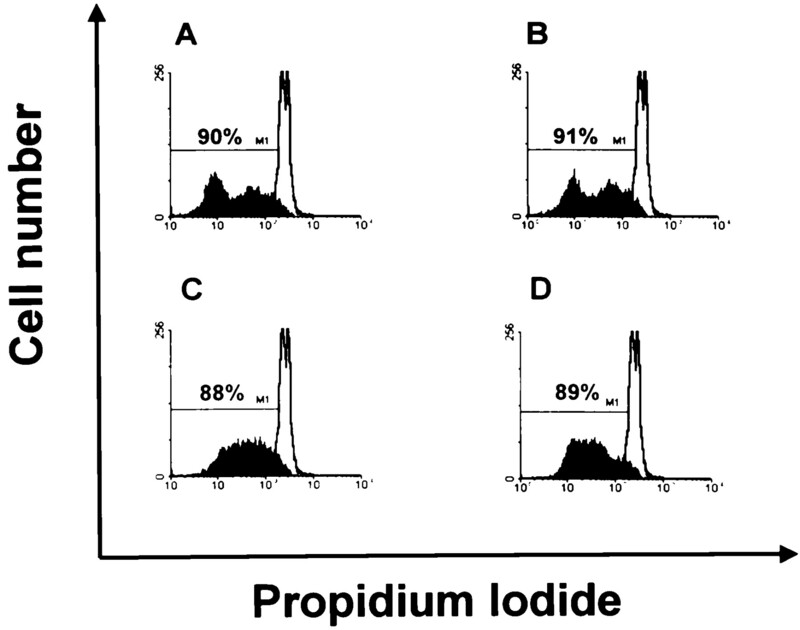 The viability of monocytes treated with GC was determined by trypan blue exclusion or by flow cytometry analysis of propidium iodide (PI) uptake from nonpermeabilized cells using standard protocols (24, 34). IL-1β and TNF-α were determined in supernatants of cultured monocytes using sandwich ELISAs developed by Immunotech (Marseilles, France). IL-1β and TNF-α ELISAs had a sensitivity of 5 pg/ml. A standard cytokine preparation (recombinant cytokine with defined concentration) was used as internal control in all tests. All assays were tested for cross-reaction by adding several cytokines and soluble receptors to different cytokine standards. Mifepristone was added to monocytes that were cultured for 48 h in the presence of different concentrations of dexamethasone. (Mifepristone was used at a concentration 10 times higher than the GC to block the GC receptor) (31). To inhibit caspase activity, we added a caspase-3 inhibitor to GC-treated monocytes (DEVD-CHO, 10−6 M) (28, 29, 30). Apoptosis was determined by staining with annexin-V as described above. Results are given as the mean ± SD. For statistical analysis, the Student’s unpaired t test was used. Statistical significance was considered if p was <0.05. All experiments were performed at least 10 times with different blood donors, unless otherwise indicated. Treatment with GC induced apoptosis in human monocytes. We were able to demonstrate monocyte apoptosis with four independent methods. By measuring annexin-V/CD14 binding on cell surfaces and TUNEL, we were able to identify the early stages of apoptosis. Agarose gel electrophoresis and TEM were performed to demonstrate the late stages of apoptosis. Using FACS analysis, we determined a significant increase of annexin-V-positive cells from 14% up to 71% after incubation with dexamethasone at different concentrations and a decrease of CD14+ cells from 52% to 12% (Fig. 1⇑B). Using the TUNEL method, we were able to demonstrate GC-induced apoptosis in monocytes by fluorescence staining as well as by FACS analysis (Fig. 2⇓). Although the control population showed only few TUNEL-positive cells with a homogenous fluorescent nucleus, almost all cells of the dexamethasone-treated population were TUNEL-positive. Stimulation with a high dexamethasone concentration (10−4 M dexamethasone) induced nucleus fragmentation (Fig. 2⇓). Apoptosis was quantified in parallel by fluorescence microscopy and FACS analysis. We were able to demonstrate an enhancement of TUNEL-positive cells after stimulation with dexamethasone from 30% up to 95% (Fig. 2⇓). In addition, we were able to demonstrate apoptosis by characteristic DNA-laddering using agarose gel electrophoresis (Fig. 3⇓). In the time kinetics, specific DNA-laddering could be shown after dexamethasone (10−6 M) incubation lasting for >72 h. Apoptosis-specific laddering was dose-dependent at dexamethasone concentrations of 10−6 M to 10−4 M after an incubation period of 72 h (Fig. 3⇓B). Using low concentrations of dexamethasone, only intact genomic DNA could be identified. Morphological alterations of GC-treated monocytes were determined by TEM. Fig. 4⇓, A–C shows normal, typical control monocytes, whereas Fig. 4⇓, D–F demonstrates three morphologically altered monocytes stimulated with 10−6 M dexamethasone. Fig. 4⇓, A–C represents a normal nucleus-plasma-relation with a predominance of the cytoplasm. We also observed heterochromatic DNA in the nucleus and intact cytoplasmatic organelles in control monocytes. In Fig. 4⇓, D–F, the relation between nucleus and cytoplasm is shifted to the nucleus. In GC-treated monocytes, we show shrunk cells, a condensed nucleus, and increased vacuolization of the cytoplasm. These signs are typical of apoptotic cells. Measurement of apoptosis in monocytes using the TUNEL method. 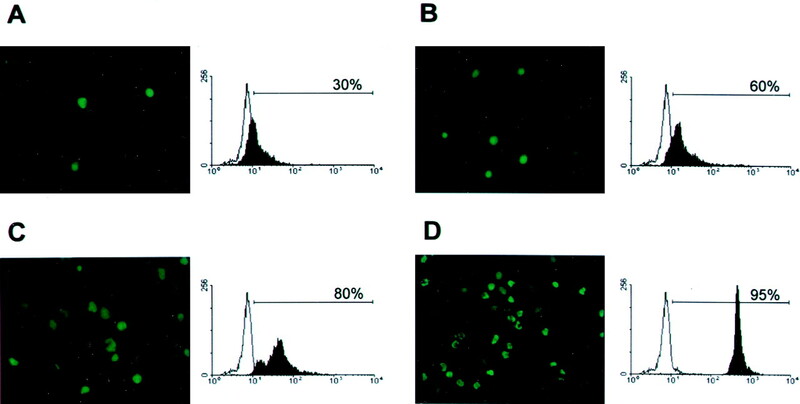 Monocytes were cultured in medium alone (A) for 48 h or were incubated with different dexamethasone concentrations (B, 10−8 M dexamethasone; C, 10−6 M dexamethasone; D, 10−4 M dexamethasone) and examined by fluorescence staining as well as by FACS analysis. Stimulation with high concentrations of dexamethasone (D) induced nucleus fragmentation. Apoptosis was quantified in parallel by fluorescence microscopy and FACS analysis. The open histogram is the negative control, stained without TdT, whereas the filled histogram represents TUNEL-stained cells. We were able to demonstrate an enhancement of TUNEL-positive cells after stimulation with dexamethasone from 30% up to 95%. Oligonucleosomal DNA cleavage of monocytes after dexamethasone treatment. Electrophoresis of DNA isolated from 1 × 107 monocytes was performed after 0 h, 24 h, 48 h, 72 h, 96 h, and 120 h (A) and after 72 h (B). 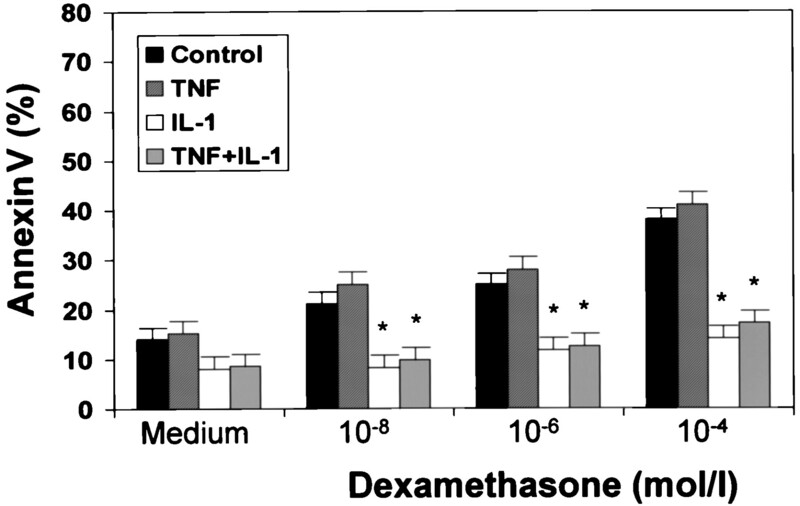 Monocytes were treated with 10−6 M dexamethasone (A). The DNA-specific laddering could be demonstrated after an incubation period of >72 h. There was also a dose dependency (B) with apoptosis-specific laddering at dexamethasone concentrations from 10−6 M to 10−4 M after 72 h of cell culture time. Nucleosomal DNA fragments were detected by ethidium bromide staining. A m.w. marker of a 100-bp DNA ladder was run as a control. Electron microscopic features of monocytes treated with GC. Monocytes were cultured in RPMI 1640 medium for 72 h without GC (A–C) or with 10−6 M dexamethasone (D–F) before being prepared for TEM. In the control population, nearly all monocytes remained intact concerning morphology of the nucleus and cytoplasm. After dexamethasone treatment, monocytes exhibited typical signs of apoptosis, with dense nuclear condensation, degeneration of organelles, cytoplasmic hypervacuolization, and loss of plasma membrane microvilli. Magnification is ×7200. GC induced apoptosis in human monocytes in a dose- and time-dependent manner. 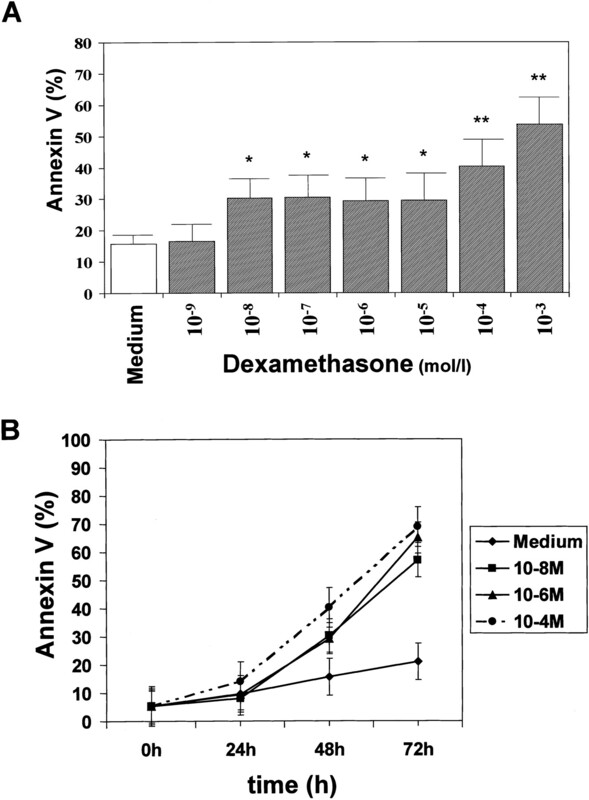 We were able to demonstrate a significant increase of annexin-V-positive cells at rising dexamethasone concentrations (10−8 M to 10−3 M) from 30.3% (p < 0.05) to 53.7% (p < 0.01) (medium: 15.6%) (Fig. 5⇓A). After an incubation period of 48 h, we noticed a significant increase (and a strongly significant increase after 72 h) of annexin-V-positive monocytes. Annexin-V-positive monocytes in the medium were 21.7% after a 72-h incubation, whereas an increase was found in the dexamethasone-treated group of up to 50.1% at 10−8 M (p < 0.01), 65.05% at 10−6 M (p < 0.01), and 69.0% at a concentration of 10−4 M dexamethasone (p < 0.01) (Fig. 5⇓B). Dose dependency and time kinetics of annexin-V binding on monocytes after incubation with GC. A, Monocytes were cultured for 48 h in the presence of different concentrations of dexamethasone (10−9 M to 10−3 M); there was a strong dose dependency of annexin-V staining on GC concentrations. B, Monocytes were cultured with dexamethasone for different incubation periods and at different concentrations (10−8 M, 10−6 M, and 10−4 M). There was a significant dependency of annexin-V staining on the time of incubation. Data represent means ± SD from 10 independent experiments. ∗, p < 0.05; ∗∗, p < 0.01 (compared with medium control). 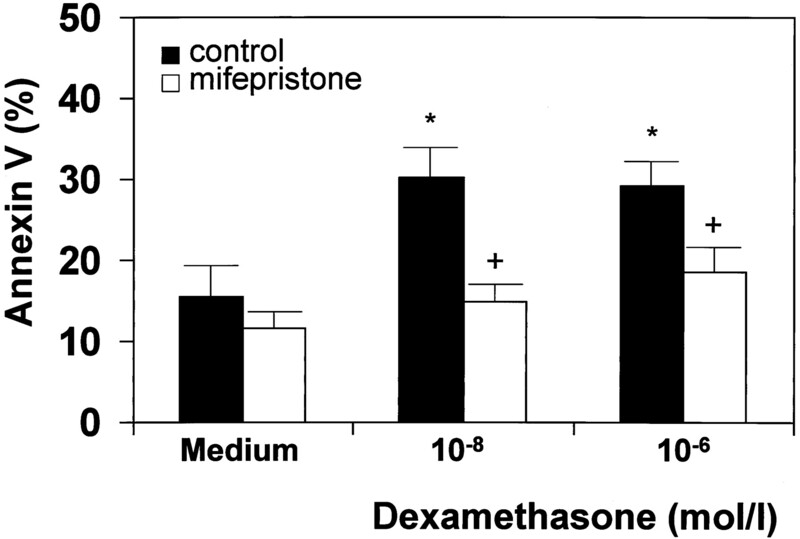 Monocytes were incubated with mifepristone (10-fold higher concentration than the GC) (31) to block the GC receptor and with dexamethasone (10−8 M and 10−6 M). We determined a diminished rate of apoptosis in monocytes that were cotreated with GC and mifepristone (30.2% vs 19.7%; 10−8 M dexamethasone vs dexamethasone plus mifepristone, p < 0.05) (Fig. 6⇓). Blocking of GC receptor by incubation with mifepristone. Monocytes were cultured for 48 h in the presence of different concentrations of dexamethasone (10−8 M and 10−6 M). In addition, they were stimulated with mifepristone (at a 10-fold greater concentration than the GC). Apoptosis was measured by multicolor flow cytometry. Data represent means ± SD from five independent experiments. ∗, p < 0.05 (compared with medium control); +, p < 0.05 (compared with dexamethasone without mifepristone). We were able to demonstrate that GC receptor blockade decreased GC-induced apoptosis. 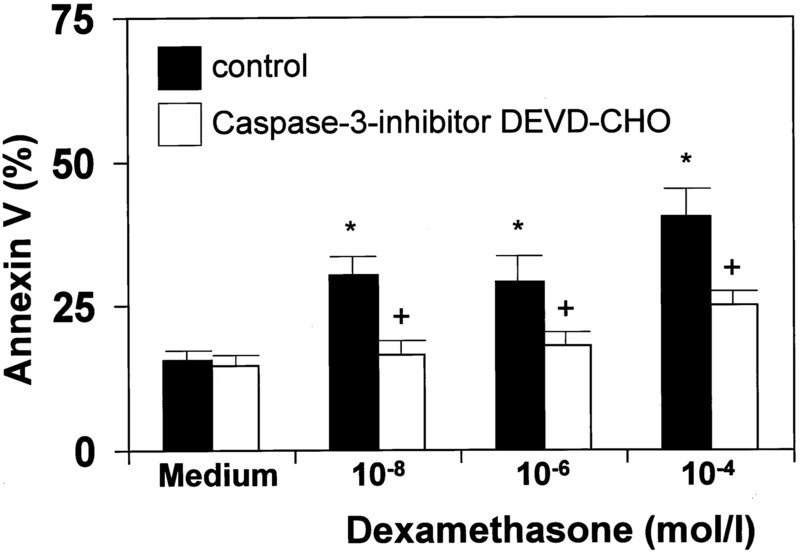 Monocytes were costimulated with different concentrations of dexamethasone (10−8 M, 10−6 M, and 10−4 M) and with caspase-3 inhibitor (10−6 M DEVD-CHO) (28, 29, 30). After 48 h of cell culture, apoptosis was measured by annexin-V staining. We were able to demonstrate that GC-induced apoptosis was diminished in monocytes that were treated with caspase-3 inhibitor (30.2% stimulated with 10−8 M dexamethasone vs 16.4% treated with 10−8 M dexamethasone plus DEVD-CHO; p < 0.05) (Fig. 7⇓). Effect of caspase-3 inhibitor on GC-induced monocyte apoptosis. Monocytes were cultured for 48 h in the presence of different concentrations of dexamethasone (10−8 M, 10−6 M, and 10−4 M). In addition, they were stimulated with caspase-3 inhibitor (10−6 M). Apoptosis was measured by multicolor flow cytometry. Data represent means ± SD from five independent experiments. ∗, p < 0.05 (compared with medium control); +, p < 0.05 (compared without caspase-3 inhibitor stimulation). The GC-induced apoptosis in human monocytes could be partially blocked with caspase-3 inhibitor. Monocytes were cultured for 48 h and stimulated with different concentrations of dexamethasone (10−8 M, 10−6 M, and 10−4 M). Cells were further treated with proinflammatory cytokines (50 U/ml TNF-α, 50 U/ml IL-1β, and 50 U/ml TNF-α plus 50 U/ml IL-1β) every 8 h. Apoptosis was determined by flow cytometry. We were able to demonstrate that continuous stimulation with IL-1β almost completely prevented GC-induced monocyte apoptosis. The monocyte apoptosis induced by different concentrations of GC decreased after treatment with IL-1β (Fig. 8⇓). In contrast, treatment with TNF-α induced no changes or even an increase of apoptosis. Effect of IL-1β and TNF-α on GC-induced monocyte apoptosis. Cells were cultured for 48 h and stimulated with different concentrations of dexamethasone. In addition, they were treated with TNF-α, IL-1β, and TNF-α plus IL-1β (50 U/ml for each cytokine) every 8 h. Data represent means ± SD from five independent experiments. ∗, p < 0.05 (compared with control). The continuous addition of IL-1β (or the combination of IL-1β plus TNF-α, but not TNF-α alone) significantly decreased GC-induced apoptosis. We examined different GC with regard to their capacity to induce apoptosis in human monocytes. Prednisolone, hydrocortisone, and dexamethasone were tested by the same relative concentrations according to their biological strength in human compartments. The cell culture incubation period for these experiments was 48 h. All drugs induced apoptosis in human monocytes in a dose-dependent manner (Fig. 9⇓). After an incubation period of 48 h, we determined the following annexin-V-positive monocytes: medium: 15.6%; concentration B: 10−6 M dexamethasone at 29.3%, 4 × 10−6 M prednisolone at 25.8%, and 3 × 10−5 M hydrocortisone at 36.0% (p < 0.05) (compared with medium control). After stimulation with higher concentrations of GC (concentration C: 10−4 M dexamethasone, 4 × 10−4 M prednisolone, and 3 × 10−3 M hydrocortisone), there was also a strongly significant induction of apoptosis (p < 0.01). Comparison of different GC preparations on the induction of monocyte apoptosis. 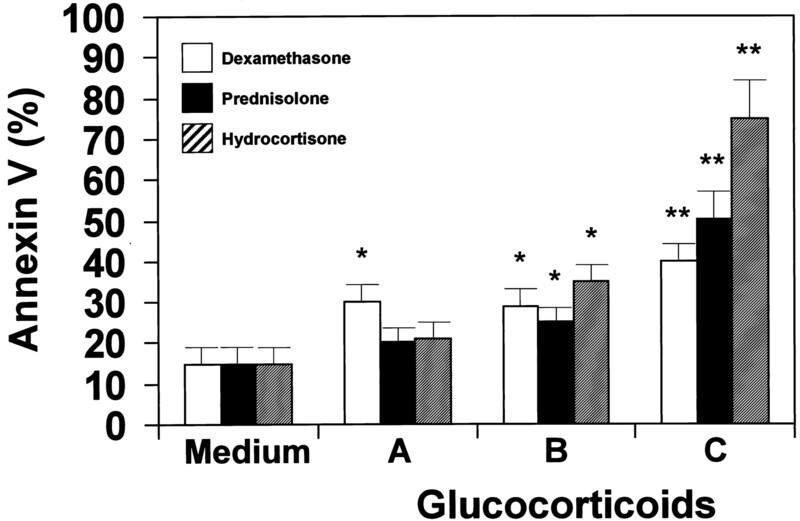 Prednisolone, hydrocortisone, and dexamethasone were tested using the same relative concentrations according to their biological strength in human compartments (A, 10−8 M dexamethasone, 4 × 10−8 M prednisolone, and 3 × 10−7 M hydrocortisone; B, 10−6 M dexamethasone, 4 × 10−6 M prednisolone, and 3 × 10−5 M hydrocortisone; C, 10−4 M dexamethasone, 4 × 10−4 M prednisolone, and 3 × 10−3 M hydrocortisone). All GC preparations induced apoptosis in human monocytes in a dose-dependent manner. ∗, p < 0.05; ∗∗ p < 0.01 (compared with medium control). The exclusion of necrotic cell death is essential for the demonstration of programmed cell death (PCD). For this purpose, monocytes were incubated with different dexamethasone concentrations for 48 h in cell culture and stained with PI. Untreated monocytes with permeable cytoplasma membrane served as positive controls. As shown in Fig. 10⇓ treatment with various doses of dexamethasone failed to increase PI staining compared with controls (filled histogram). After a 48-h incubation, we found 90% PI-negative monocytes in the control medium, whereas the ratio was 91% in monocytes treated with 10−8 M dexamethasone, 88% in monocytes treated with 10−6 M dexamethasone, and 89% in cells stimulated with 10−4 M dexamethasone. Exclusion of necrosis by PI staining. Cell necrosis of monocytes cultured for 48 h after stimulation with different concentrations of dexamethasone was measured by PI staining during FACS analysis (A, medium control; B, 10−8 M dexamethasone; C, 10−6 M dexamethasone; D, 10−4 M dexamethasone). Filled histograms represent monocytes treated with different dexamethasone concentrations. Open histograms representing monocytes with permeable cytoplasma membrane served as a positive control. There was no significant difference between PI-negative monocytes in any experiment. To examine the influence of GC on cytokine production, we performed ELISAs of TNF-α and IL-1β in cell culture supernatants. Monocytes were incubated with different concentrations of dexamethasone as well as with mifepristone and caspase-3 inhibitor for 48 h. We noticed a down-regulation of cytokine production depending upon GC concentrations (Table I⇓). After an incubation period of 48 h, a strong decrease of TNF-α (64.0 ± 15.1% to 29.2 ± 13.4%; control vs 10−4 M dexamethasone; p < 0.01) and of IL-1β (327.6 ± 38.2 to 126.1 ± 20.3; control vs 10−4 M dexamethasone; p < 0.01) was evident. Incubation with mifepristone (10−5 M) partially diminished the effects of GC on IL-1β production by monocytes compared with cells treated with dexamethasone (10−6 M) alone (299.7 pg/ml IL-1β vs 172.1 pg/ml IL-1β). Caspase-3 inhibition (caspase-3 inhibitor, 10−6 M) also partially abrogated the effect of GC on IL-1β secretion in monocytes compared with dexamethasone (10−6 M)-treated cells alone (274.2 pg/ml vs 172.1 pg/ml IL-1β). This is the first study demonstrating that GC at therapeutic concentrations (dexamethasone from 10−8 M to 10−6 M) can evoke apoptosis in human monocytes in a time- and dose-dependent manner. Monocytes and macrophages belong to one of the main immune cell populations that are involved in a wide range of inflammatory disorders. The immunosuppressive and anti-inflammatory actions of GC are mediated through actions on different cell types, including monocytes and macrophages. These effects are brought about by the suppression of secretion of various cytokines, including TNF-α and IL-1β, which contribute to the immune and inflammatory activities of monocytes and macrophages. Induction of apoptosis in monocytes as a potential immunomodulating mechanism of GC has not yet been described. In the present study, the apoptotic effects of GC on highly purified populations of human monocytes have been determined by four different methods. As marker for early apoptosis, we performed binding studies with annexin-V, which was bound on apoptotic monocytes. A significant increase of annexin-V-positive monocytes after stimulation with dexamethasone was observed. TUNEL also became strongly positive in monocytes treated with GC in a dose-dependent manner. Later on by means of TEM, GC-treated monocytes revealed typical morphological signs of apoptosis, such as cytoplasmic hypervacuolization and chromatin condensation of the nucleus. Apoptosis was further confirmed by characteristic ladder patterns in DNA electrophoresis. Monocyte necrosis could be excluded using PI staining. In our study, we used GC concentrations from 10−9 M to 10−6 M, which are reached in the treatment of acute or chronic inflammatory diseases. To exclude the different properties of various types of GC, dexamethasone, prednisolone, and hydrocortisone were examined. When we compared the relative concentrations of these GC depending upon their biological strength, we could not find any significant difference concerning their apoptogenic capacity. We could further demonstrate a diminished induction of apoptosis after cotreatment with the GC receptor antagonist mifepristone. Therefore, we conclude that there is a direct receptor-mediated effect of GC on monocyte apoptosis. GC-induced monocyte apoptosis could also be partially blocked by treatment with caspase-3 inhibitor. Caspase-3 is a main enzyme in the apoptosis-signaling pathway that deactivates poly(ADP-ribose)-polymerase and therefore seems to be involved in GC-induced monocyte apoptosis. Until now, the exact mechanisms of the immunosuppressive activity of GC were unknown. It is likely that multiple modes of action exist (35). High-affinity GC receptors have been identified in earlier studies (36). Monocytopenia (37) as well as diminished chemotaxis and decreased antimicrobial activity have been described elsewhere. In addition, it could be demonstrated that monocyte-derived proinflammatory cytokines such as IL-1, IL-6, and TNF-α are suppressed by GC (9, 17, 38). Down-regulation of the proinflammatory cytokines TNF-α and IL-1β by GC has also been determined in our monocyte culture system. Recently, it has also been suggested that proinflammatory cytokines such as IL-1β and TNF-α exert anti-apoptotic effects as they rescue monocytes from undergoing apoptosis and prolong survival of monocytes (24, 25). Down-regulation of anti-apoptotic mediators such as TNF-α or IL-1β as determined in our study may promote apoptosis in monocytes. We were able to demonstrate that continuous treatment with IL-1β, in contrast to TNF-α, almost completely prevents GC-induced apoptosis. Therefore, IL-1β seems to have important antiapoptotic properties, and it is conceivable that the observed effects of GC-induced monocyte apoptosis are mediated through effects of GC inhibition of IL-1β production. However, the partial reversal of GC-induced IL-1β inhibition of caspase-3 antagonism implies that apoptosis is required for full inhibition of IL-1β. This suggests a direct effect of apoptosis on IL-1β production rather than these effects being exclusively in the reverse direction. In activated immune cells, the induction of apoptosis may be an additional important mechanism by which GC to exert their anti-inflammatory properties. There are several reports demonstrating that immunosuppressive agents, including GC, induce apoptosis in T lymphocytes (39, 40), whereas no study deals with GC-induced apoptosis in monocytes. The induction of PCD by immunosuppressive or anti-inflammatory cytokines has recently been described by others. IL-4, a T cell-derived cytokine that acts on monocytes, as well as IL-10, have been shown to induce apoptosis in peripheral monocytes (26, 27, 33). PCD as evoked in monocytes by immunosuppressive agents such as steroids or anti-inflammatory cytokines may therefore be an important mechanism in the treatment of immunomediated diseases, in addition to the well known monocyte-deactivating effects of these mediators. Following steroid treatment, systemic monocytopenia may be a consequence of an increased rate of monocyte apoptosis. The induction of apoptosis in monocytes by GC may have two contrasting effects. During the state of inflammation, the induction of PCD in highly activated monocytes, which secrete a variety of mediators maintaining inflammation, may have therapeutic benefit. The disadvantage of monocyte apoptosis, however, may be that potent immune cells belonging to the mononuclear phagocyte system will be eliminated. Consequently, an increased risk of infectious diseases may develop in patients treated with GC. All in all, our data suggest that induction of apoptosis in human monocytes appears to be an important way for GC to exert their anti-inflammatory and immunosuppressive properties. The monocyte apoptosis induced by immunosuppressive agents such as GC may regulate cell number at the inflammatory site and also reduce release of toxic mediators into systemic circulation. ↵1 This work was supported by the Wilhelm Sander-Stiftung (München, Germany) through Grant 96.046.1 and by the Interdisciplinary Center for Clinical Research, 17KF-D13. ↵3 Abbreviations used in this paper: GC, glucocorticoid(s); PCD, programmed cell death; PI, propidium iodide; TEM, transmission electron microscopy. Munoz, C., J. Carlet, C. Fitting, B. Misset, J. P. Bleriot, and J. M. Cavaillon. Dysregulation of in vitro cytokine production by monocytes during sepsis. J. Clin. Invest. 88:1747. Yoshida, Y., K. Kang, M. Berger, G. Chen, A. C. Gilliam, A. Moser, L. Wu, C. Hammerberg, and K. D. Cooper. Monocyte induction of IL-10 and down-regulation of IL-12 by C3b deposited in ultraviolet-exposed human skin. J. Immunol. 161:5873. Dickensheets, H. L., S. L. Freeman, M. F. Smith, and R. P. Donnelly. Interleukin-10 upregulates TNF receptor type-II (p75) gene expression in endotoxin-stimulatedhuman monocytes. Blood 90:4162.